As Metro Vancouver remains under a snowfall warning today, drivers aren’t the only ones struggling with the poor weather conditions. 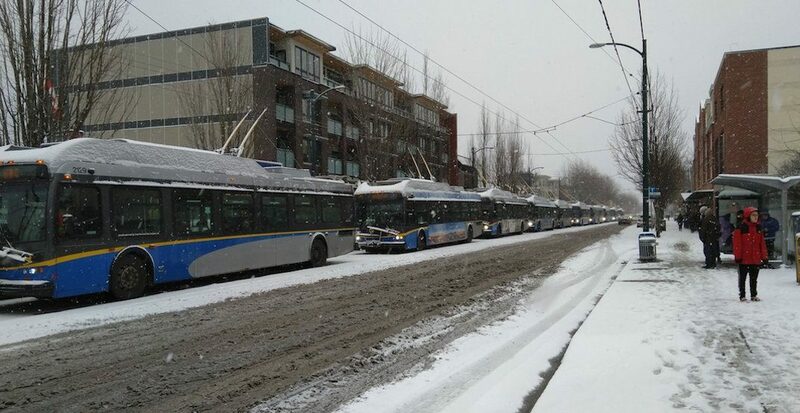 As transit riders head to work this morning, Translink has announced a number of service disruptions and transit delays due to the inclement weather. The major snow storm that hit the region over the weekend has created some rough areas that are expected to impact all types of traffic, including transit, this morning. Despite extensive snow clearing across the region, commuters should expect some delays due to the need for vehicles to travel with caution at slower speeds in many areas. Commuters can expect extra crowding expected on some routes and to provide improved traction, Translink says many articulated buses have been switched with standard, 40-foot buses. This will mean some modified service, with increased crowding and the possibility of pass-ups in some areas. Currently operating essential services only for renal and cancer patients. Customers on Production Way-bound Expo Line trains must switch trains at Columbia Station. There is a slight reduction in service currently on Expo and Millennium lines due to intrusion alarms being activated by snow/ice and the need to manually staff trains in certain areas. Expo Line operating King George to Waterfront in both directions. Shuttle train between Columbia Station and Lougheed Station due to inclement weather. Customers must transfer at Columbia or Lougheed to continue their journey. Service is operating normally, but use caution on train platforms due to snow buildup. Commuters are encouraged to dress for the elements, wear proper footwear and expect occasional service disruptions throughout the day. Translink is also reminding riders to plan ahead and give themselves extra travel time. Riders should also check Trip Planner or sign up for transit alerts to be the first to know if there are changes to the transit schedule.